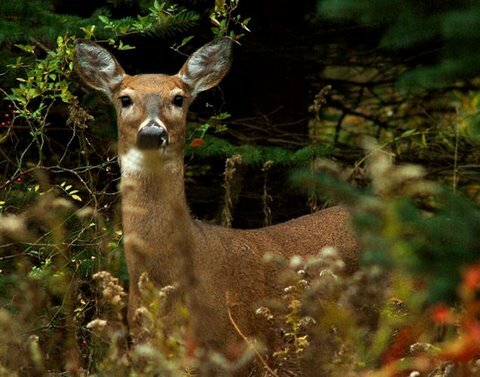 When it comes to whitetail deer information, taking a specific look at the deer whitetail doe and the buck during the various seasons of the year can provide you with an in depth look at this animal and how they survive. While the summer time is a more relaxed and lazy time for the whitetail doe, when fall comes around, things start picking up again. So, let's take a closer look at the doe and how she survives during the fall months. You'll find the spring and summer to be a bit more passive; however, once fall comes around, you'll find that things become far different. Fall is usually the breeding season, in which the females reach the time when they are ready to breed. Before the actual breeding begins, usually does and bucks begin to start grazing together, and the main reason for this is so that the does can see the antlers on the bucks in the group. In the weeks before the rut, the deer whitetail doe is preparing for this time. Her inner organs begin to change in preparation, and she continues to eat well. In fact, usually the doe is looking her best during the early fall months, since she has been working to store up fat for the winter months that are coming. In some cases, even young females that are only about 7 months old may breed, although some do not until the next breeding season. Usually you'll find that the most breeding will occur during November for does, although in some cases it can occur later. If doe does not get bred when she first comes into heat, usually she will go into heat again about a month later to try the process again. 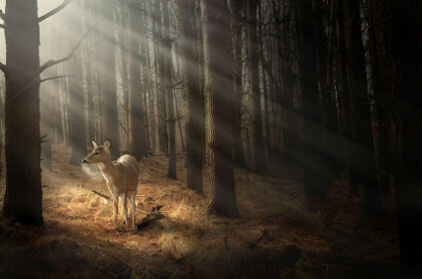 Believe it or not, it is the doe whitetail deer that chooses the buck to breed within the end. Until they come into season, they will run away from males that pursue them. However, once they are fully ready to breed, they will actually stand still for the one buck that they choose. Some people say that Whitetail does actually look for bucks that are healthy, large, and strong. This way she can give her fawn the best possible chance of being smart and healthy. Not sure if we have any proof of this but it makes a good story. Usually it is in the fall when you see the most movement from the deer whitetail doe, since this is the breeding season. Often the does are moving, trying to get away from bucks if they are not yet ready to breed. This is a time when many does get hit on the roads as well, so it is important that drivers are aware that deer are moving during this time. Also, since many areas are full of hunters during the fall, this can get females and males alike moving to escape humans. The fall is definitely a busy time for the female doe whitetail deer when she is preparing for breeding season and getting ready to be pregnant. Of course not only is she preparing for the pregnancy, but the hard winter months as well. So, the fall is definitely a crucial season for the whitetail doe.